Tamara Sevunts. Actress. NYC & MTL. The adventure continues as “Your Alice” heads to the Arcola Theatre in London for an industry reading. 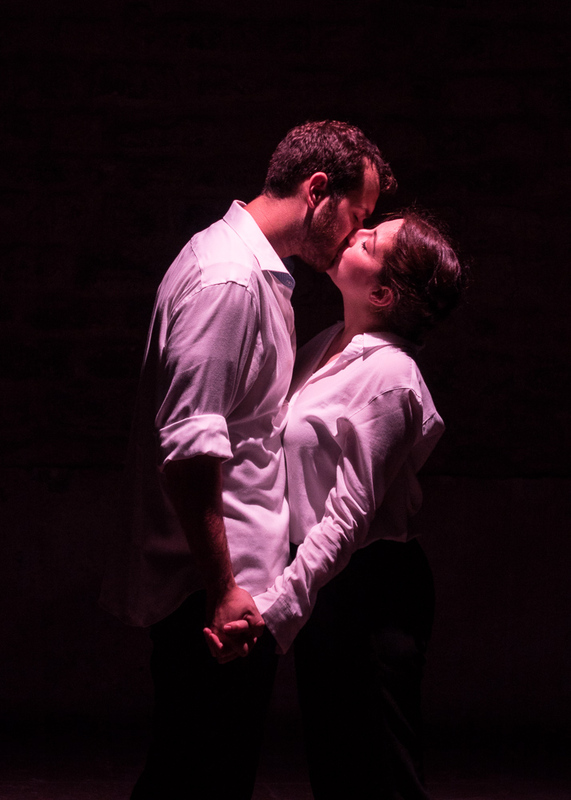 A beautiful review from Syma News’ Florence Yérémian sets the scene for Black Garden’s success in Paris, at the Théâtre de l’Opprimé’s Pleins feux sur la jeune création festival. Click here to read it. À bientôt Edimbourg, Bonjour paris! Up next: Black Garden, written by Gordon Penn and directed by Arthur Makaryan, makes its debut at Théâtre de l'Opprimé in Paris, September 5 - 9. Click here to get your tickets and find out more about this new work! Your Alice makes it UK debut at the Edinburgh Fringe Festival. Reviews are in and they're calling us 'mesmerizing' and a 'masterpiece of modern theatre'. Five stars all around. Get updates and full reviews here. The Cheshire Cat and Alice at BAM, NYC. Photo courtesy of Danny Bristoll Photography. A World Premiere at THE Beckett Theatre at Theatre Row! Daybreak tells the story of two Armenian women, survivors of the genocide, bound by friendship and launched into the future through their search for healing. Magic, music and roses transport us from 1915 into the future. Daybreak is produced by PanAsian Repertory Theatre. Tickets are available at WWW.TELECHARGEOFFERS.COM. Code TRDAYA. Show previews April 21, opens April 26 and runs until May 13, 2018. Our little show that could, Your Alice, is headed to BAM for a short and explosive run May 23 - May 27, 2018. Grab'em tickets while you can. TALE OF THE ANGUISHED GARDENER HAS A TRAILER! We filmed October 2017 in Armenia and now we're officially in post-production. Take a look! It's a New York City premiere—at the Lincoln Center, no less!— for "You Can't Go Home Again", featured with 5 other Armenian films. Get your tickets here. 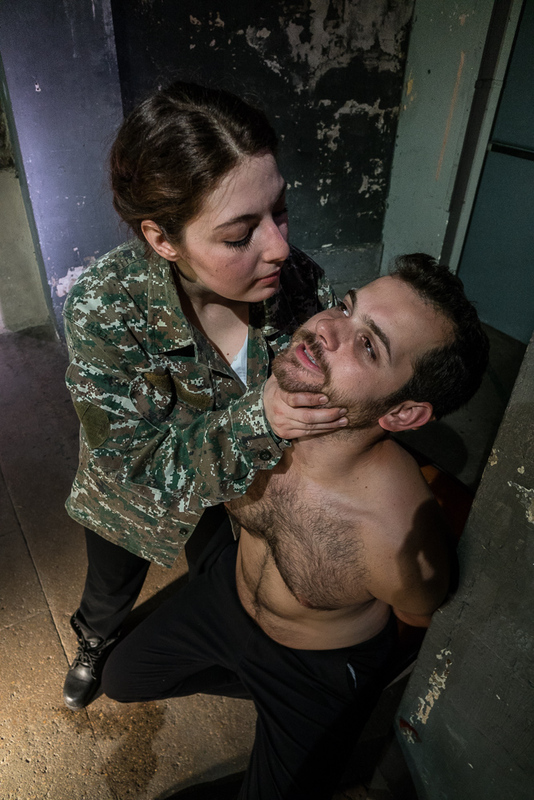 Ara Woland and Tamara Sevunts in Ovsanna Gevorgyan's "You Can't Go Home Again". I'll be up in the air before the week is over... Follow along on Instagram as I head to Armenia to film "Tale of the Anguished Gardener", a short film by Ovsanna Gevorgyan. Looking up to the skies. From the very talented Farah Hosny. An all-female Measure for Measure at the Scranton Shakespeare Festival has me exploring the darker side of comedy as Angelo. If you're in the area this summer, don't miss the show. Reserve FREE tickets online. Jillian Geurts and Tamara Sevunts as Isabella and Angelo in Measure for Measure. Scranton Shakespeare Festival 2017. Coming to you in April, a new twist on the beloved Lewis Carroll story Your, Alice, gets recognition in Playbill! The workshop performance of cul-de-sac, written by John Cariani (writer of Almost, Maine, original cast member of Something Rotten! ), and directed by Adam Fitzgerald gets the BroadwayWorld treatment. Some projects have finally seen the light past the post-production tunnel. Check it out! I made a disembodied appearance in the US Premiere of Emily Collyer's The Good Girl. Read the reviews here: Huffington Post, New York Times, Theater Pizzaz. You won't want to miss this beast. Starring Leah Gabriel and Giacomo Baessato. Directed by Adam Fitzgerald. Runs 11 Feb - 25 Feb at 59E59 Theatres. A taste of Ovsanna Gevorgyan's abstract short, from diaries of an invulnerable woman. IN CASE YOU MISSED IT... SPOTTED! Getting my study on behind Victoria Justice, in Naomi and Ely's No Kiss List. And yes... It was on Netflix! The Real American, shown as part of the Kalinigrad Film Festival in Russia, and The 2015 New York Television Festival, won Best Narrative Short at Listapad in Minsk! It's now headed to Romania and most exciting of all, to the Oscar-qualifying Atlanta Film Festival! LOOSE CANON WINS THE THEATERMANIA AUDIENCE FAVOURITE AWARD! TheaterMania lists us on their Top 7 shows to see at The Fringe Festival this year! And we move to the SoHo Playhouse for a limited Off-Broadway run! It's finally coming to a password protected website near you! A slice of life, comedy and how the mighty fall in the Big Bad Apple. Created by Jonathan Stephens. Written by Jonathan Stephens, Sophie Overwater and myself! OnStage New York Critic Thomas Burns-Scully reviews George C. Heslin's production of The Laramie Project, in which I played Amanda Gronich, and 5 more characters. Burns-Scully writes "[Sevunts] is able to believably and triumphantly play characters whose ages vary by decades, [and] does turns as everything from grandmothers to young drug addicts." Read the full review here. The Real American, directed by Darya Zhuk, tells the story of young post-Soviet exchange student, Alya, and how in her attempts to assimilate to 90s American culture, she discovers her host father's attraction for her. Inspired by true events, keep your eyes pealed for the wonderfully creative work of director Darya Zhuk, and producers Viktorya Aleksanyan and Mitch Waxman.